Yosemite And the Unexpected VisitorPlease listen to this Yosemite Audio PostCard, a story about this national treasure and an unexpected park visitor .Yosemite itself is the iconic image of a national park made famous by Ansel Adams and his obsession to capture in dramatic photographs the magical play of light falling on cedars and shadows. Please listen to this Yosemite Audio PostCard, a story about this national treasure and an unexpected park visitor . 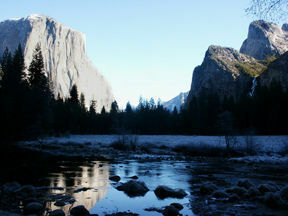 Yosemite had lost none of its appeal to the great spirit.